Growing up, it wasn’t unusual for someone in my house to decide to be on a diet. There were clues to when these times came around: certain foods would be off limits to us kids, like when the pantry was stocked with NutriSystem foods or the freezer had diet fudgsicles. You also knew it was diet time when the only crackers you could find in the house were these thick, plywood-like, flavorless sheets that came in a cardboard box wrapped in paper…Wasa crackers. This was back when “diet food” tasted terrible, but as dieters you’d feel virtuous eating it. If it tasted good, it must be bad for you, right? 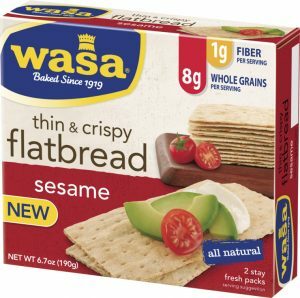 Wasa crackers to me were the epitome of diet food. As I’ve mentioned before, a perk of being a dietitian is that I sometimes get food samples to try out. So when a few packages of Wasa crackers arrived, I was curious. These were not the Wasa crackers of my youth, but new thin and crispy flatbread crackers. I should say right off the bat, I love flatbread crackers. I could eat them plain or topped with cheese. But the brand best known for making quarter-inch-thick bricks of crackers is now making flatbread thins? This I had to try. There were three flavors to sample: original, sesame and rosemary. I tried the rosemary first, since I love pretty much anything seasoned with rosemary. These did not disappoint. For a thin little crisp, it was quite a burst of flavor. There was a perfect mix of rosemary and sea salt, which gave the cracker a rustic taste. I could eat these by themselves…and I did. At 70 calories per two flatbread crisps, eating a couple of these is great when you’re craving potato chips or something crispy and salty. Next I tried the sesame. I was a little dismayed that these crackers didn’t have whole sesame seeds sprinkled on top, but the flavor was really good. Again, there was a hint of salt and rosemary, but not as strong as the rosemary crackers. These were also good by themselves or with a topping (I used different kinds of cheeses). Last I tried the original. It was bland, which was a bit of a letdown at first but actually worked out well as a basis for strong cheese or hummus. Nutrition-wise these crackers are pretty good. As I mentioned before, two crackers supply 70 calories and contain 8 grams of whole grains (half a serving), and whole wheat flour is listed as the first ingredient. I was a little surprised that you only get 1 gram of fiber for every two crackers, but then again, it’d be hard to boost the fiber and still keep the cracker thin and light. 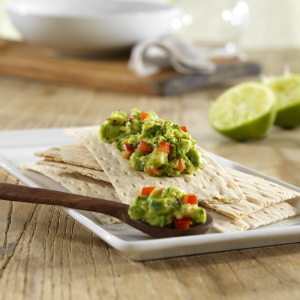 Besides, if you’re itching for more fiber, just top a flatbread with some hummus or guacamole. Easy…and delicious!